Apply Offline for the TANCEM Recruitment 2018 from this page. 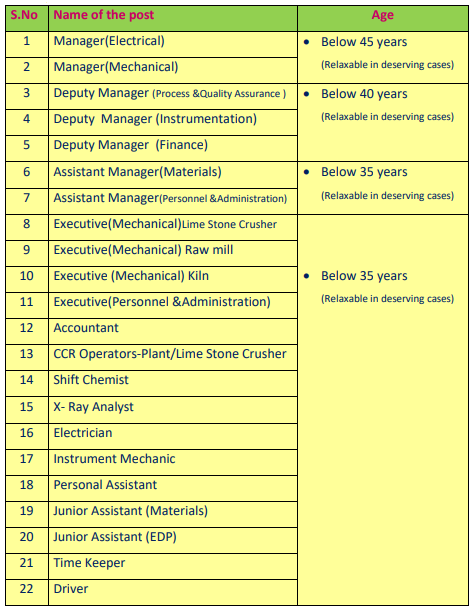 The officials of the Tamilnadu Cements Corporation Limited (TANCEM) had invited the application forms to fill the 46 Junior Assistant Vacancies. So, grab the complete information given in this page. You can apply for the tancem.com Openings 2018 from 16th September 2018 to 10th October 2018. Grab the details mentioned like the pay scale, the தமிழ்நாடு சிமெண்ட்ஸ் கார்ப்பரேஷன் லிமிடெட் Selection Process and the Eligibility, Process to apply and the direct link to download the Official TANCEM Recruitment 2018 Notification & Application Form PDF. 1.6 How To Apply For TANCEM Recruitment 2018? Candidates should check the below-given information to apply for the TANCEM Recruitment 2018. Deputy Manager (Finance): CA / CMA + 2 years of experience with a proven track record on Costing, Budgeting Taxation, and the Finalization of Accounts. Assistant Manager (Materials): B.Tech. Or B.E. + Diploma in Material Management + 5 Years in the field of the materials inventory. Assistant Manager (Personnel & Administration): The Master of Social Work or M.B.A (Optional Subject as the HR) or the M.A. (Sociology) or Post Graduates possessing DLLAL / PG Degree / Diploma – Personnel Management & Industrial Relations granted by the recognised University / Institutions + 5 years experience in the field of personnel management out of which 3 years in the level of Executive (P&A) or Officer Cadre. Executive (Mechanical) Lime Stone Crusher, Executive (Mechanical) Raw mill, Executive (Mechanical) Kiln: B.E / B. Tech (Mech) + 5 years (in one-million-ton capacity Cement Plant). Junior Assistant (EDP): B.Sc (Computer Science) Degree with PG Diploma in Computer Application + 2 Years in the field of the EDP. Executive (Personnel &Administration): The Master of Social Work or M.B.A (Optional Subject – HR) or M.A. (Sociology) or Post Graduates possessing DLLAL / PG Degree / Diploma – Personnel Management and Industrial Relations granted by the acknowledged University / Institutions + 2 years experience in the field of personnel and administration. 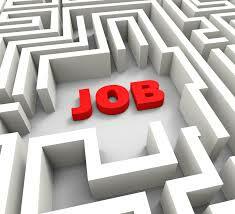 Accountant: 10th + 12th + B.Com degree + 5 years in the field of Finance and Accounts. Driver: 10th or 12th passed/failed to have valid LMV driving license + 5 years as Driver. Refer the official Notification for the TANCEM Recruitment 2018 to know the தமிழ்நாடு சிமெண்ட்ஸ் கார்ப்பரேஷன் லிமிடெட் Application Fee. 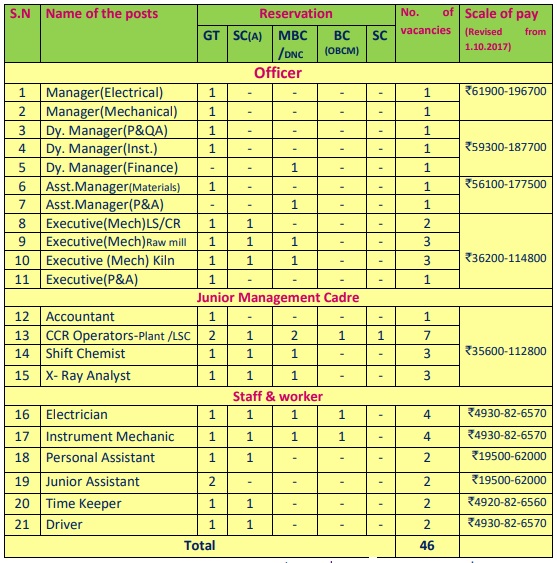 The Selection Process for the TANCEM Recruitment 2018 is the Merit List, Interview. How To Apply For TANCEM Recruitment 2018? Contestants should download the applications from the official website of the Tamil Nadu Cement Corporation Limited @ tancem.com career portal to apply for the TANCEM Recruitment 2018. And the eligible aspirants should send their filled in application forms along with the copies of self-attested documents or the testimonials in a cover or the envelope with the superscription of “Application for the Post of…………………………………..” to the following address by the Post or Courier. Check the latest information relevant to the TANCEM Recruitment 2018 from our Sarkari Recruitment website.